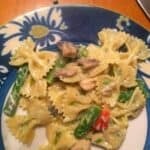 Creamy bow tie pasta tossed with chicken, asparagus and mushrooms for a tasty spring meal. In a large pot of boiling salted water, cook the pasta for 4 minutes. Add asparagus and cook for about 4 to 6 minutes, until the pasta is tender but firm and the asparagus is tender. Drain well and return to the pot, toss with a tablespoon of olive oil. Take care not to overcook the pasta, given that it will cook a bit more when you heat it with the cream cheese. Get the chicken started when you start boiling the water. In a large skillet, melt the butter with oil over medium-high heat. Add chicken and cook, stirring often for about 5 minutes, until it starts changing color to white. Add mushrooms and garlic, cook for 7 minutes or until chicken and mushrooms are browned. Stir in seasoning. Set aside, cover and keep warm if the chicken is ready before the pasta. When the pasta is drained and the chicken is cooked, toss them together in the pasta pot. Add the cream cheese, and return the pot to medium heat. Stir in the milk to make a creamy sauce, adding extra milk as needed to achieve your desired consistency. Serve and enjoy!